This article is a brief introduction about call costs based on call length in relation with Ozeki VoIP SIP SDK. After reading through this page you will be fully familiar with all the essential terms concerning billing by call length and what you will need for creating your own solution using Ozeki VoIP SIP SDK. Telephone calls are rarely free except for full VoIP solutions or some special service subscriptions, therefore you need to be familiar with the possible billing technologies. One of the most essential billing methods is the one that counts the calling costs by the length of the call. The more you talk the more you pay (Figure 1). 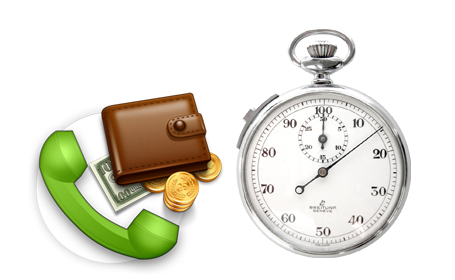 The billing by call length can be done by using minutes or seconds as the basic measurement unit. The decision about this is essential. It can be stated that the billing per seconds can give you the possibility to have greater phone costs as the call length can be longer when the caller knows that if they speak for 2 minutes and 3 seconds, they will pay for two minutes and three seconds and not for 3 minutes. In this case the service provider can define the calling costs so that a minute can cost more in case of the billing by seconds than in case of minutes. It is usually done so. In case of billing by minutes the customers think it over twice if they want to initiate a call as the cost can be higher, because you pay for 3 minutes even if your call only takes 2 minutes and one single second.